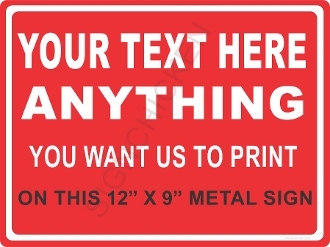 This bright red will look great with your custom message. We will print anything you like. Simply use the drop down menu during checkout to let us know what you want it to say. Simply choose your colors and text...it's that easy. NOTE: WE WILL PRINT IT EXACTLY HOW YOU TYPE IT LINE BY LINE. PLEASE PAY SPECIAL ATENTION TO SPELLING AND CAPITALIZATION. WHEN CHOOSING COLORS KEEP IN MIND THAT DARK COLORED TEXT WILL NOT DISPLAY WELL WOTH DARK BACKGROUNDS. BE AWARE THAT T MORE TEXT YOU HAVE THE SMALLER THE TEXT FONT WILL NEED TO BE.